Sound can be noise, it can be distraction, it can be enjoyable, beautiful or soothing, and it can also be a direct route to clearing the mind. Sound reaches the brain faster than thoughts, faster than images or sensation. So, if you listen mindfully, you can silence the inner chatter and be. I recently attended a concert of healing music, a sound bath, in a St. Paul’s Episcopal Church in Truth or Consequences. It wasn’t religious music, but it was sacred. I started out with thoughts of writing, of possible scenes and settings, since one of my ongoing characters is a musician who composes healing music. He would have loved the event (writers think this way about their characters), but I forgot about him during the performance. The beauty of the experience was getting past verbal thought altogether and into pure sound—bells, electronic tones, rain sticks, non-melodic music created to promote a meditative state or an inner journey. The composer/performer encouraged the small audience to close their eyes and go inward, and I did. 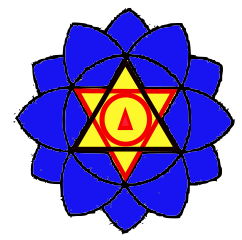 The music came through eight speakers in patterns that gave it a spatial structure and a quality of movement that triggered flowing abstract color visions in my mind, and yet I was always grounded and present in my body, aware of my own energy. 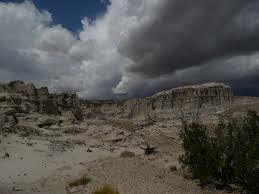 The next morning I still had a lingering sense of deep clarity, as if I had been meditating. And that is not the way I normally feel before coffee! If you have a chance to hear his music in person, don’t miss it. Out my back window, across the alley, I have a view of a white trailer with chain-link fence around a typical T or C back yard of dirt and gravel. 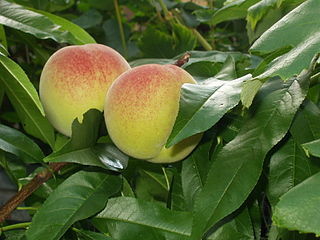 In it is a peach tree, full of fruit that I have watched ripen over the summer, and no one is picking any of it. If you don’t know the desert of New Mexico well, you might be surprised at the way fruit trees thrive here, soaking up sun in the heat of June and water in the downpours of July. 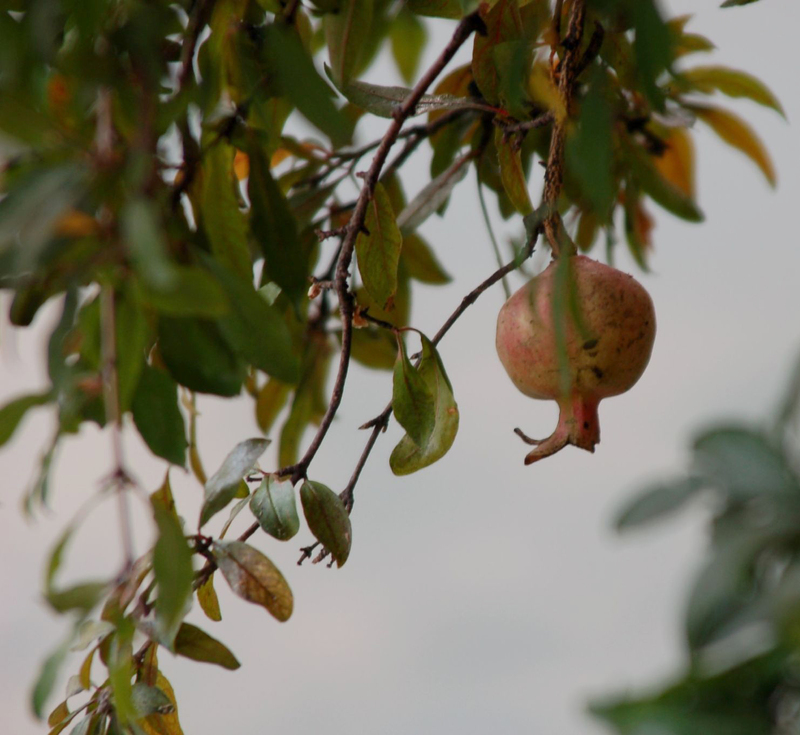 Three pomegranate trees, heavy with fruit, bow toward the street on my route to the pool. 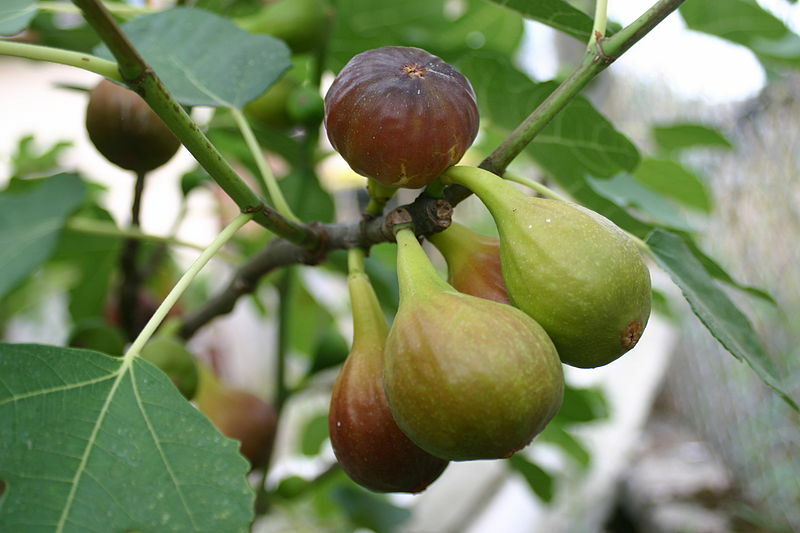 In front of my apartment, a shrub-like fig tree is producing a massive crop, some newly ripened, many green and still growing. When I lived in Santa Fe, I knew where to find apricots falling to the sidewalks and parking lots, so abundant no owner could possibly pick and eat them all. I have a crisper drawer full of gift peaches from a friend’s neighbor’s tree. 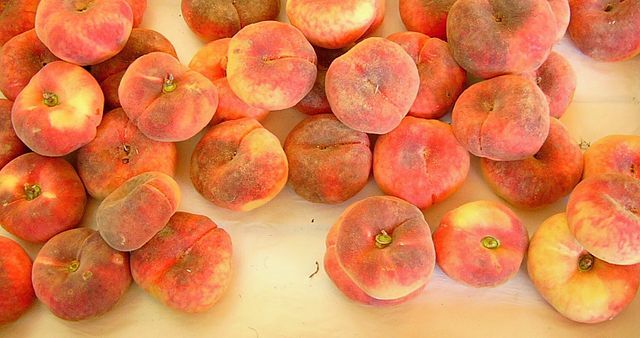 As small and velvet-skinned as apricots and just as dense, they are super-sweet, as if growing in a desert made them work harder to become peaches. Still, I look at the ones across the alley behind the fence and see one lying in the gravel, a perfect yellow-and-pink sphere, and it bothers me. A moment someone missed and can never have now, knocked down by yesterday’s storm. It’s not that I want their peaches. I want them to have their peaches. What aspect of my life is that fallen peach? What is ripe that I am not picking? I know I can’t make the sky rain. It’s like trying to make someone love you. When the right conditions have arrived, the change comes. Sometimes, however, I think it fails to rain when the world is out of balance, and that it takes dancing and meditation, yoga done as rain salutations, people showing compassion and affection and listening to each other with their hearts, to invite rain. Love and care for the earth will call rain. Earlier today, it rained in the alley behind my apartment for one minute. I went for a short walk at sunset, and a massive blue-black cloud was flashing lightning out toward Elephant Butte, revealing the rain as a sheer curtain in each orange flare. I did a little dance, spinning and then running backwards, asking the storm to follow me home. It did, but I don’t take credit. When I was running in the desert around noon today, I encountered a mule deer. They often look you in the eye before they run. If they even run. We circled a juniper, checking each other out, making eye contact through the branches, then she turned her back to me, did two full springs straight up in the air with a graceful tuck of all four legs, and trotted off. If anything had the power to call the storm, she did. The deer did the rain dance. Unrelated, but perhaps of interest: The Calling, book one in the Mae Martin series, is on sale for 99 cents on all e-book retail sites through July 21st. If you’ve enjoyed my books, tell a friend. Thanks. The Austin Art Factory, an outdoor performance venue accessed through an alley, is attached to a warehouse used by the New Mexico Film Office, full of lighting equipment and props ranging from ratty old chairs to enormous books and a variety of weathered signs, including a wall-sized one for the New Mexico State Prison that served as the backdrop on Sunday July 2nd for a traveling circus (all humans, no animals) from New Orleans. The audience was seated on rows of blue plastic chairs and a few wooden benches under a corrugated metal roof. Behind us was a stack of trunks about eight to ten feet high. To the right was the warehouse, where the performers had their backstage area and the audience could find rest rooms. To the left was a gravel-paved yard whose chain-link fence is decorated with art made from New Mexico license plates (the yellow ones). My favorite is a Volkswagen Beetle. An old tow truck sits in the yard, full of random objects, perhaps as a work of art, perhaps as storage. The show opened at 6:00 p.m. with a guest performance by local acoustic duo Desert Milk. After that beautiful, mellow music came circus side-show acts such as knife-throwing, dancing barefoot on broken glass, and breaking a cinderblock on a man’s chest while he lay shirtless on a bed of nails. An acrobat squirmed her way in and out of a birdcage. The weirdest act was done by a woman who drove a long sharp nail up her nose with a sequined hammer and had an audience member pull it out with her teeth. A cowboy performer did rope tricks and pistol-twirling and whip-cracking, cutting a rose in half with a whip while he held the flower between his teeth. The emcee talked too much and used “exciting” and “excited” so many times she could have killed the excitement she was trying to rouse, but I had to forgive her because, after all, she did drive that nail up her nose. The best part of the evening: the aerialists. T or C’s Jeannie Ortiz floated with dancelike grace and power in fluid, seamless weavings of her body and supporting drapes of fabric. Without a break in her flow, she wrapped a limb or her pelvis in the silks and moved from backbends to splits to side arcs and inversions in perfect concentration. Her art was ethereal and meditative and yet awe-inspiring at the same time. As I watched her suspend herself with the silks attached only at the feet and ankles in a split, I knew what this was asking of her at the muscular and biomechanical level, probably her most impressive feat when it came to strength, though the audience expressed more enthusiasm for the aesthetically stunning moves. And there were many. This was not just athleticism but visual art, dreamlike and magical. The circus aerialist was equally strong but performed at a higher speed in a spinning hoop. She did the near-impossible, hanging upside-down only from the edge of her heels or from the curve of her buttocks and then transitioning to a new pose without any loss of control or use of her hands. The style of her performance was showy, smiling and making eye contact and striking applaud-me poses. And applaud we did. She earned it. But I think the audience applauded Jeannie even more. Not only because she’s local, but because she never once demanded that we appreciate her. She simply gave her art with quiet grace. This being T or C, the audience, of course, was almost as colorful as the show. And the sky, as I walked home, was filled with brush-stroke clouds in all directions, remnants of a failed attempt at a thunderstorm, streaking the horizon with gray silks of aerial rain. Follow this link to a New Mexico Magazine feature on Twenty Things to Love About Truth or Consequences. The slide show at the end of the article includes, among other images, Jeannie Ortiz on aerial silks and some of license plate art.